Louie Orr was a star player from Cincinnati, Ohio who was the first recruit of new head coach Jim Boeheim. 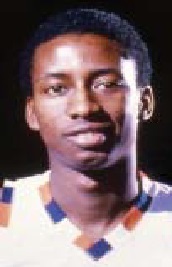 A tall splinter of a player, Orr would combine with Roosevelt Bouie to form the Bouie 'N Louie show at Syracuse, an outstanding four year record of 100-18. Orr was an intelligent player with a soft shot and a tremendous instinct for rebounding. Orr started his career as a solid free throw shooter and became an excellent one by time he graduated. He developed excellent passing skills, and possessed a good 15 foot jumper that could pull opposing defenses out from the basket. Orr was fantastic on the fast break, running the court with ease. Orr was a valuable sixth man most of his freshman year. Everyone would start to take notice when he had a 15 point, 20 rebound effort in a win over American University. A couple games later he put up 20 points and 11 rebounds to beat West Virginia. Orr would move to the starting lineup his sophomore season and started every game his last three years. He and Bouie formed a dynamic one-two punch, both able to score inside and rebound. The two players complimented each other well. The two led Syracuse to the Big East regular season championship in the conference's inaugural season in 1980. Orr would have a career high 29 points, along with 17 rebounds, in a win at St. John's his senior year. The Orangemen would be upset by Iowa in the NCAA Sweet Sixteen, though Orr had 16 rebounds in the loss. Orr earned All-America honors his senior season, and was named first team Big East. He was the 28th pick of the 1980 draft, taken in the first round by the Indiana Pacers. He played two seasons with the Pacers, and then six more with the New York Knicks, with career high 12.7 ppg in the 1984-85 season. Orr would have a solid but unspectacular NBA career, playing in the playoffs four of his eight seasons. After his NBA career ended, Orr began his coaching career as an assistant at Xavier from 1991-1994, and then as an assistant at Providence College from 1994 to 1996. In the 1996-97 season, Orr returned to Syracuse as an assistant coach for Boeheim. He would be an assistant at Syracuse for four years until the end of the 1999-2000 season. Orr left Syracuse in 2000 to become the head coach of Siena College. He lead Siena to a 20-11 record, and tied for the MAAC conference championship in his first year. A hot commodity, Orr then became the head coach of Seton Hall University. In the 2002-2003 season, he lead the Pirates to a 21-10 record, and earned Big East Coach of the Year honors, becoming the first person to earn both all conference honors as a player and as a coach. Orr had a record of 80-69 at Seton Hall over five seasons, rebuilding their program and taking them to two NCAA berths, from 2002-2006. He became the head coach of Bowling Green starting in the 2007-08 season. He coached the Falcons to the Mid-American Conference championship his second season there, and was named the MAC Coach of the Year. He was fired from Bowling Green in 2014. His overall coaching record was 201-201. Orr would return to coaching as an assistant coach at Georgetown in 2017. Orr was named a Vic Hanson Medal of Excellence winner in 1990 by Syracuse University. He was named to the Syracuse University All Century Team in 2000, and a Syracuse Letterwinner of Distinction in 2006. Syracuse retired his uniform along with Roosevelt Bouie's in February 2015.